Every so often a Ranger/Tracker team will hit a purple patch. 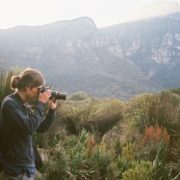 The bush just seems to offer up amazing sighting after amazing sighting, and the rest of the team start thinking it might be best to simply follow in your wake, because they know it’s you who will be calling in the high-profile animals. 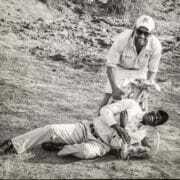 Ranger John Mohaud and tracker Euce Madonsela had such a run recently. The guests they were driving were here for a 14-night stay, and being interested in photography, were more than happy to put in the hours waiting for sightings to develop, or for John and Euce to spend the time on foot tracking big cats. 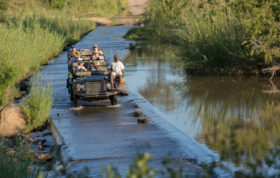 A particular run of four game drives in a row resulted in some fantastic viewing, and John was kind enough to share with us what they saw. We’ll go through it drive by drive, starting today with John’s afternoon sighting of a pack of African wild dogs. 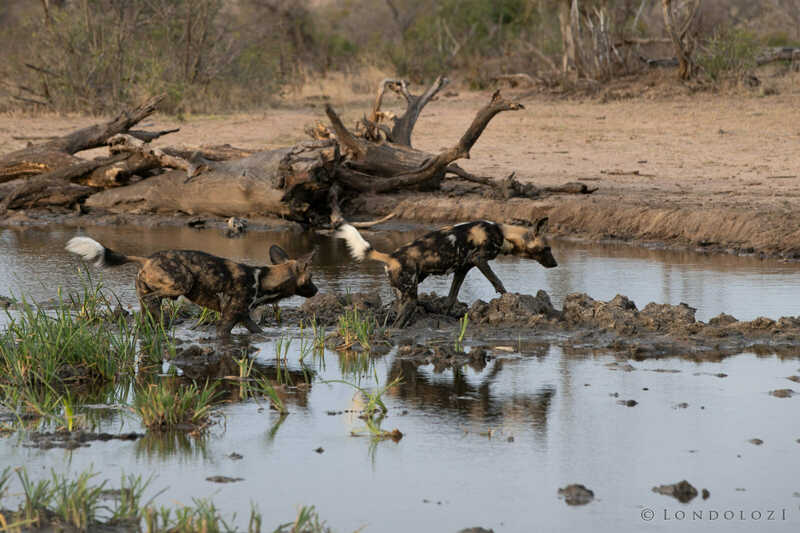 “The pack were lying near a prominent waterhole in the middle of Londolozi with their 7 pups. 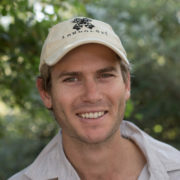 They got going just as we arrived, and chased off a young hyena who had wandered down to the pan, probably for a drink. After that the adults started running around interacting with some zebra and wildebeest. Although the young of both of these prey species have been known to be taken down by wild dogs, and even adult wildebeest in some areas, more often than not on Londolozi their prey tends to be smaller, like impalas or young kudus. What was funny to observe was how unsure of themselves the pups were. They are still far too small to get involved in any chasing. Although wild dogs will often chase zebras, one can see from the massive size difference between them how futile that chasing will usually be. This dog had things reversed. HE was the one being chased! 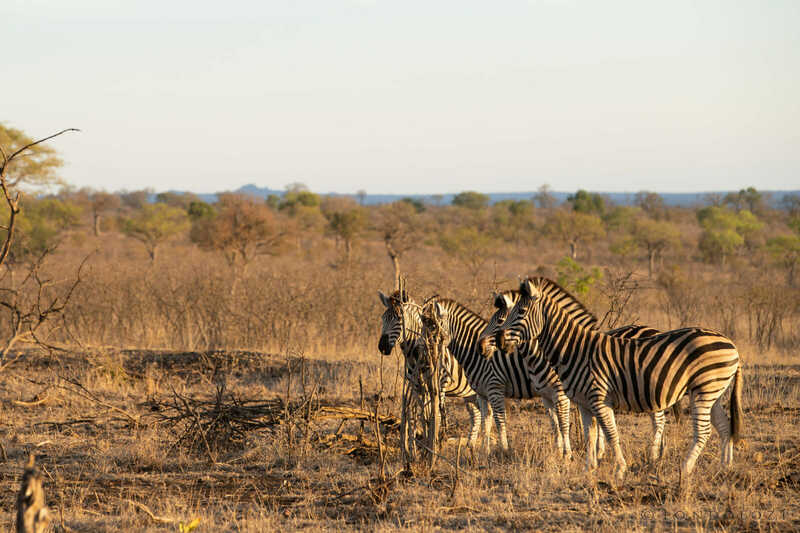 Some of the zebra herd look on without too much concern. 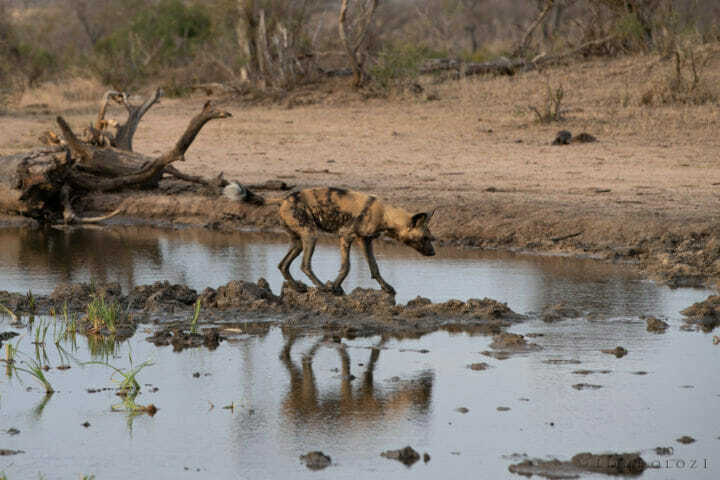 Wild dogs are ususally nervous of water as they are very aware of the danger of crocodiles. However, if a pan is deemed to be safe and crocodile-free, they will gladly enter it, splashing around and playing, and even lying down in it to cool off. This individual was clearly reluctant to get its paws wet. 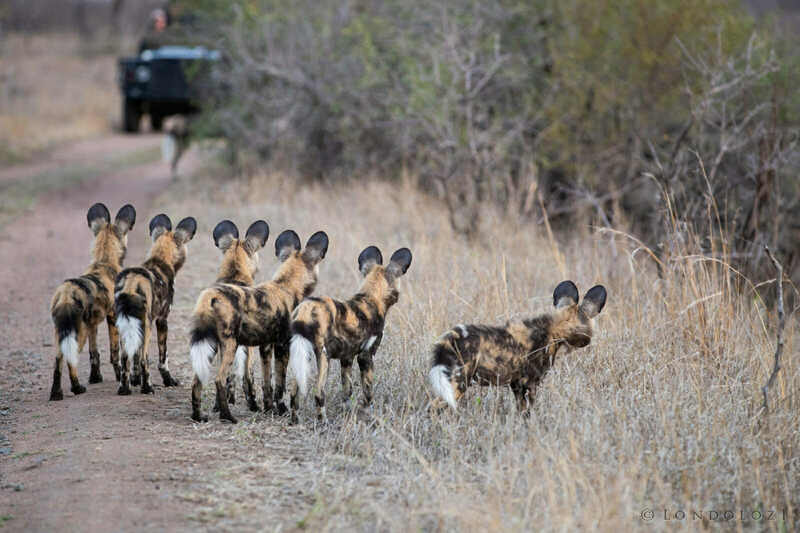 The pup looks on as the adults of the pack take off after a warthog. Still too young to get involved in the hunt, the pups will wait behind, only joining the pack once they are called. Sometimes one of the adults will wait behind with them as a sort of babysitter. 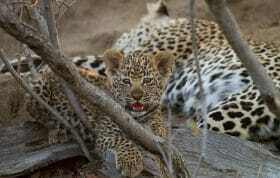 We had a spectacular first full day on our first trip–sighting the Big 5 within 6 hours. Our guide (Trevor) and tracker (Like) had to work hard to diminish expectations after that. On our first game drive, about an hour after arriving at Londolozi, our Ranger Kevin and Tracker Ray took us to see 3 lions working on a large kudu they had taken down during the night. What an amazing intro! 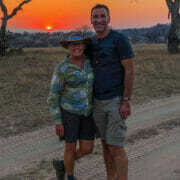 Great game drive! Thanks, James, for sharing. Incredible sighting!! Can’t wait to see the rest!! 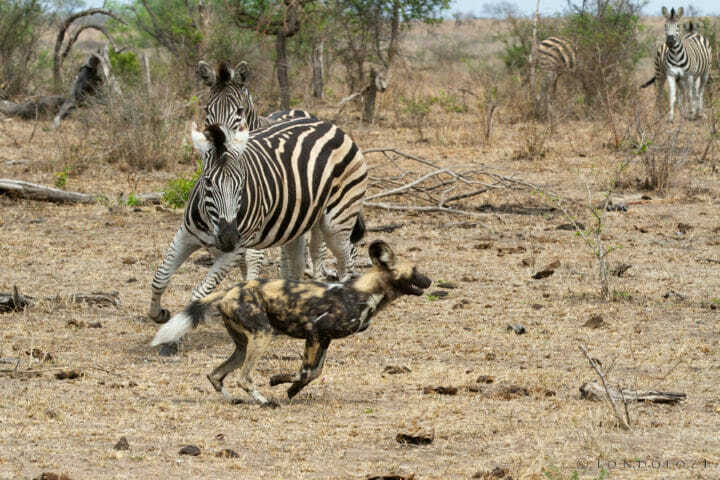 Superb video footage of the interaction between the Zebra and wild dogs, along with the image of the pups all. hanging back. 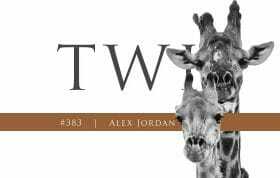 Looking forward to future installments from you. 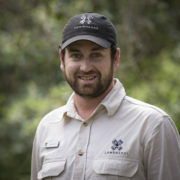 We were fortunate to have John and Euce as our ranger/tracker team during part of our stay at Londolozi. Their knowledge, friendly personality and professionalism are above reproach! The same goes for our other team of Greg and Equalizer. We were able to see so many incredible, once in a lifetime sightings as well thanks to those guys! Amazing sighting. Always great to see wilddogs.